How to add an interactive event widget to your Honey post. Have an event that you would like to share with your team? Add it directly in your Honey post. Here's how. Select the calendar icon at the righthand side of the formatting toolbar in the composition form. This will drop a calendar widget into your post form. Enter the event details and cover photo into the widget. How to use a published event widget. 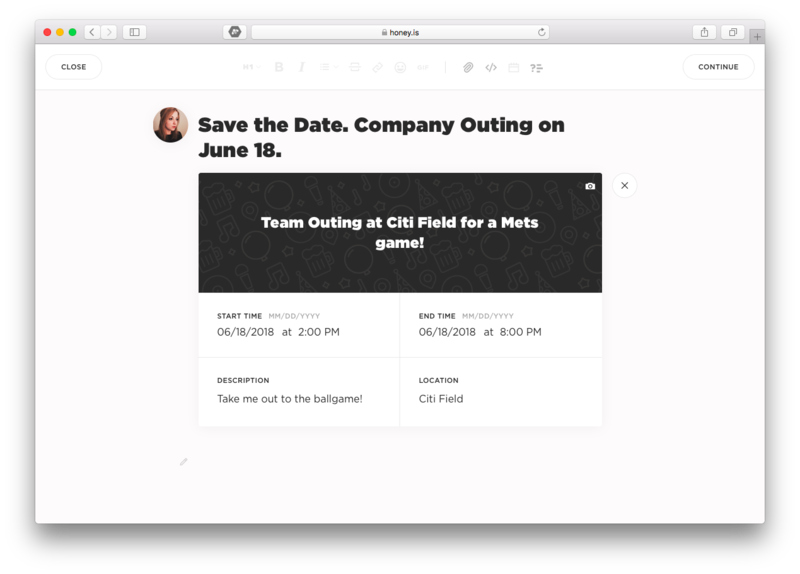 Once published, you and your team members can save your event to their personal calendars. Click Add to Calendar to download an ICS event card that you can upload to calendar tools like Outlook or Apple Calendar. Click Save to Google to save the event to your Google Calendar.